to Chinese pioneers.… Community service is a featured story in each generation of this CBC documentary. Chinese Cultural Centre Museum 555 Columbia. I attended the Opening Gala for the Heart of the City Festival 2pm at Carnegie Centre. Special guest was Lt. Gov. Steven Point. He was very funny and serious, sharing stories about his first visits to Main & Hastings as a young law student. Great news – Vancouver Sun ran a story on the front page their Arts Section. They featured a sidebar story “At a Glance” and the first event listed is Generations: The Chan Legacy! This entry was posted in Asian Canadian Cultural Events, Chinatown Vancouver, Chinese Canadian History, Cultural Fusion, Main Page, Rev. Chan Legacy Project, Todd Wong, Upcoming Events, Vancouver Heritage and History on October 27, 2010 by Todd. 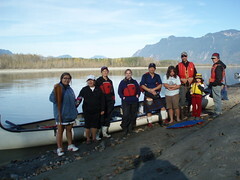 Day 5 crew of Gung Haggis dragon boat team paddlers + Chilcotin elder Gilbert. We stopped at First Nations communities along the way. 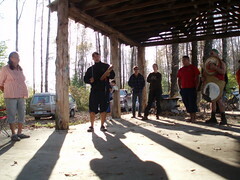 At Cheam Beach, Aaron Williams sang a song for the group. Alexandra Morton is a biologist who has written about how sea lice affect the migration of wild salmon. Elly Edwards is a the woman who dreamed up the “Paddle for Wild Salmon” journey from Hope to Vancouver. Ears Bridge) to New Westminster to Musequeam – with 7 canoes. Musqueam into the Salish Sea, around Point Grey to Jericho Beach – with 9 canoes! library – but hope to see you all at the after-party at W2 Storyeum. 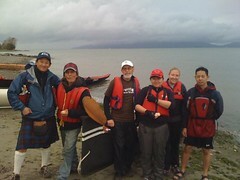 9:30am – paddle to Vanier Park (Kits Point) on voyageur canoes. wild salmon are dying of farm diseases. 10:00 am Walk with us from Vanier Park (over the Burrard Street Bridge) to the Cohen Commission. This entry was posted in Main Page on October 25, 2010 by Todd. Jennifer from Gung Haggis Fat Choy team was my lead stroke, with Colleen of FLCC Fortifed in the 2nd seat. I steered. This entry was posted in Main Page on October 24, 2010 by Todd. 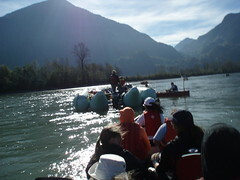 Ever want to paddle down the Fraser River and help out the sustainability of Wild Salmon? attention on the importance of the Sockeye Salmon. 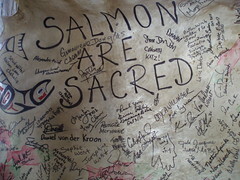 Stand Up for Wild Salmon! Sellars, Fin Donnelly MP and Bill Bourne. has been notified of the paddle and a few SAR trainees will be along. will be joining from their territory. They know the river like the fish. at the launch, so we'll want to be set for safety. There are also many other experienced paddlers who will be along to balance out the less experienced paddlers. This entry was posted in Main Page on October 19, 2010 by Todd. Great news for BC history and genealogy buffs. The CBC documentary about the Rev. Chan Family descendants is being shown at Heart of the City Festival on Oct 28.
on July 4th 2007. The purpose was to interview multigenerational families across Canada, and help tell the story of Canada through the lives of that family. I am a 5th generation great-great-grand son of Rev. Chan Yu Tan, and one of the featured stories. My grandmother's sister Helen Lee and cousin Victor Wong are both interviewed and tell stories about their grandparents Rev. & Mrs. Chan Yu Tan, whom they respectively lived with and visited as children. Victor Wong is a WW2 veteran and shares stories about becoming a soldier for Special Forces operations with his cousins Howard and Leonard Lee, while Dan Lee was one of the first Chinese Canadians in the Airforce. All this happened at a time when Canadians of Chinese ancestry were not allowed to vote in Canada, until after the Chinese-Canadian veterans returned from WW2 and lobbied the Canadian government to repeal the 1925 Chinese Exclusion Act. Gary Lee, also tells stories about Rev. Chan's sons Luke Chan, who became an actor in Hollywood, and Jack Chan – an avid golfer and the first Chinese Canadian to serve on jury duty. – which shares the history of the Rev. Chan family through her father Dennis Wong, chef of Chinese restaurants in Sasketchewan, son of the Rev's daughter Rose, and Victor's brother. 13 year old Tracey Hinder is seen winning the inaugural Vancouver area Canspell contest. Tracey goes on to compete at the National Canspell in Ottawa and the Scripps in Washington DC. Tracey is interviewed as a high school student, dedicated to learning about her community and family histoy. Todd Wong is a community and cultural activist, known for creating Gung Haggis Fat Choy Robbie Burns Chinese New Year Dinner. Excerpts from the CBC produced television performance special “Gung Haggis Fat Choy” are shown along with Todd's community commitments including the saving of the Historic Joy Kogawa House, Terry Fox Run, and dragon boat racing. This entry was posted in Asian Canadian Cultural Events, Canadian Identity & Heritage, Chinatown Vancouver, Cultural Fusion, GENERATIONS: The Chan Legacy, Hapa culture, Main Page, Rev. Chan Legacy Project, Todd Wong, Upcoming Events, Vancouver Heritage and History on October 16, 2010 by Todd. of his imagination to escape reality and help his elderly new friend. This entry was posted in Asian Canadian Cultural Events, Canadian Identity, Canadian Identity & Heritage, Hapa culture, Main Page, Multicultural events, Upcoming Events, Visual Art and related events on October 11, 2010 by Todd. Dinner a few years ago…. Ann-Marie's great-grandfather was the legendary vaudeville magician, Long Tack Sam. Her great-grandmother was his Austrian wife. Her family ancestry comes from around the world, and she describes herself as hybrid – both DNA-wise, historically and culturally. animated short I Was A Child of Holocaust Survivors Oct. 11. Survivors made you want to adapt it into an animated short? own way. I think it has universal relevance and resonance. anybody's story. Six degrees of Kevin Bacon. This entry was posted in Cultural Fusion, Hapa culture, Main Page, Multicultural events, One Book One Vancouver: Joy Kogawa's Obasan, Upcoming Events on October 5, 2010 by Todd. – same as above – but we have to take lights out on the boat. Dusk arrives early and it gets dark quicker now. 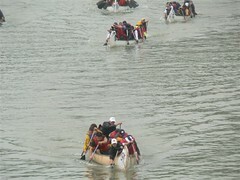 first race is 10am – marshall at 9:30am. more details to come. friends. this means 2 people will sit out each race. Chili chef for this year – who will volunteer. This year – there is a costume contest for all the teams – I have offered to donate a prize. Karen Ranalletta and Dave Samis are team captains. Traditionally – we organize the two teams into A and B teams. One team encourages veteran paddlers to race to their best potential and push it. 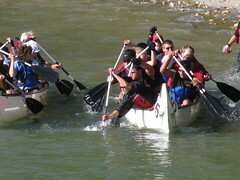 One team encourages newer paddlers to have fun, and veteran paddlers to support them. Lead stroke Tzhe Lam pulls the Gung team away from the beach after picking up the beach runner. Boats go head to head around a turn with Alissa Fletcher in lead stroke for Gung Haggis team in 2008. 2008 saw 2 boats miss the pumpkins, and finish last and 3rd last in the B final – but have lots of fun. 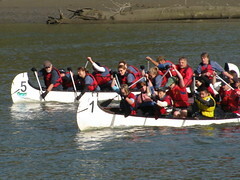 This entry was posted in Dragon Boat Information, Dragon Boat photos 2003, Dragon boat with Todd Wong - Dragon Boat Coach, Gung Haggis dragon boat team information, Main Page, Upcoming Events on October 2, 2010 by Todd. love flamenco music. My usual claim to flamenco fame, is that I have twice had dinner with flamenco guitarist legend Paco Pena. But on Thursday night at the La Zuppa restaurant in North Vancouver, I sat in with guitarist Rod Malkin and dancer Elen Ghulam. I was walking by the restaurant on Lonsdale Avenue and decided to have a listen. The music was lovely, the space was intimate and friendly. I spoke with the restaurant operators Juan Carlos and Vicky. We talked about the restaurant and flamenco music. They introduced me to Rod and Elen, and told them I play accordion. Look what I just discovered! This entry was posted in Accordions, Asian Canadian Cultural Events, Cultural Fusion, Food & Restaurants, Main Page, Multicultural events, Music, Todd Wong, Vancouver Area Adventures on October 2, 2010 by Todd.